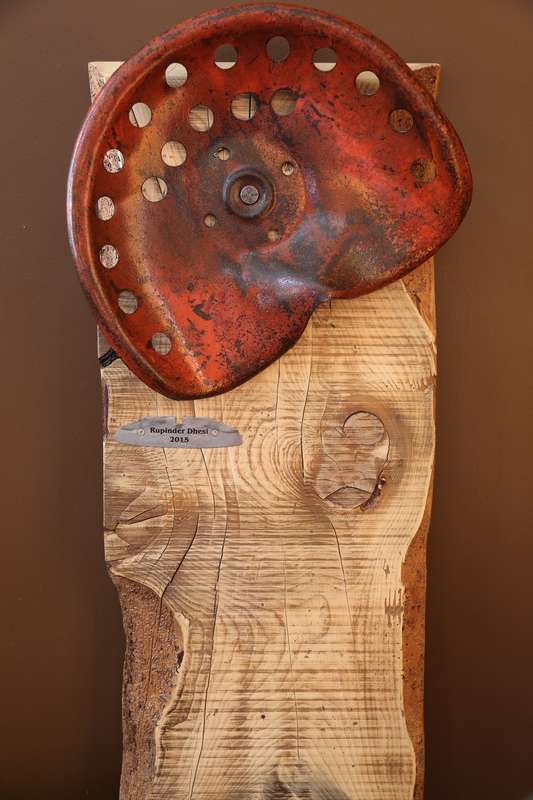 This plaque fashioned from a board that was part of the barn floor where we now have our office, and featuring an old tractor seat, will hang in the office with the names of each year’s recipient etched into a used blade of a hoe taken from the field. A description of the award will be added. At this year’s Pfenning Farm End of Season/Christmas Party we started a new tradition. 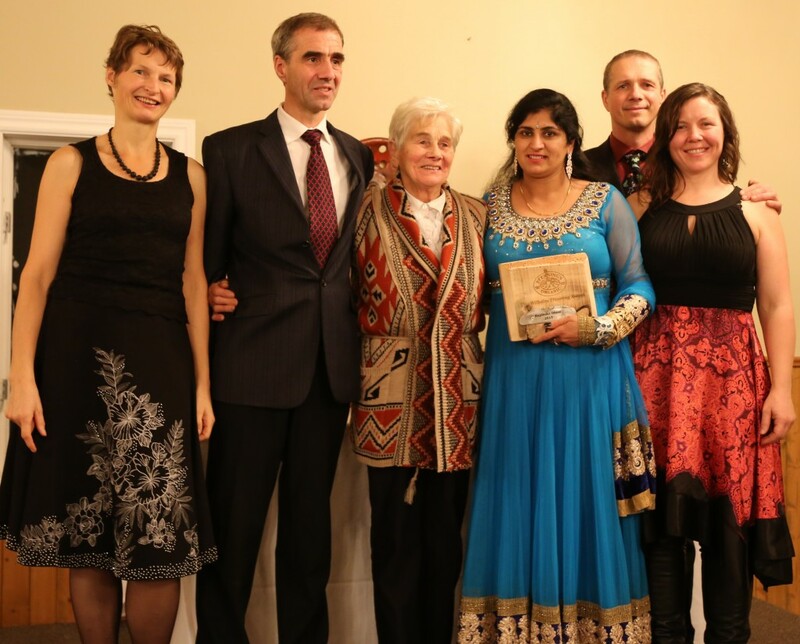 In search of meaningful ways to acknowledge and celebrate the wonderful, talented, dedicated and absolutely fantastic people that we get to work with every day, we inaugurated The Wilhelm Pfenning Award. The idea came from Celia, and was enthusiastically taken up by the rest of us. Our greatest challenge was trying to decide what the parameters should be. Some of you may know that Wilhelm, my father-in-law, passed away very suddenly nearly five years ago. Wilhelm Pfenning was a pioneer. When the world had turned to chemicals to solve farming challenges, he sought out organic methods. 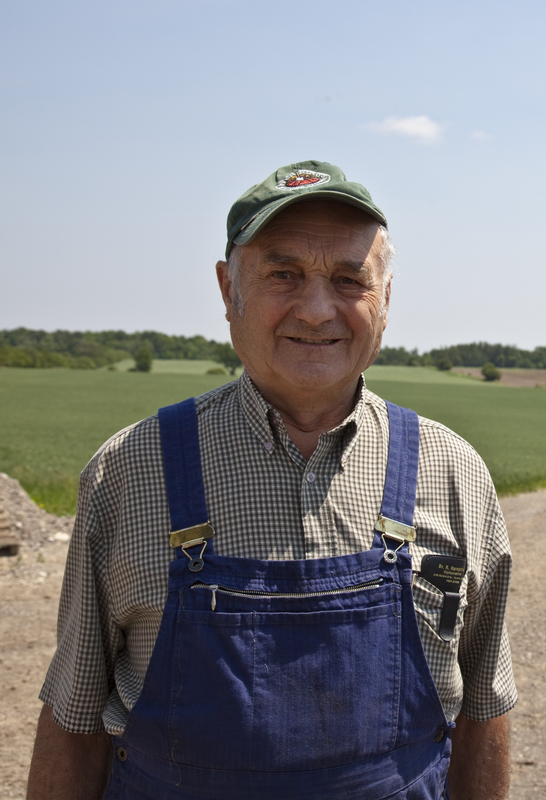 He was part of the group of people that founded the first organic certification body in Canada. But how to define a man, whose life spanned two continents, decades of history that brought upheaval and turmoil as well as the invention of the internet, cellphones, and the mechanisation of everything! Trying to distill him into a set of words that can fit on a page is a tall order. Those of us who knew him and loved him get stuck in memories of his talks about life philosophy and his sometimes rigid standards. So many little things he said every day play like a recording in our heads. One of my favourites, “We are made with two ears and one mouth, use them in that proportion”. Good advice for almost any situation! 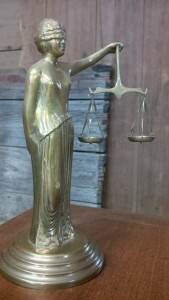 As a reminder to never let others pressure us into compromising our values he brought me a statue of Justice. Every day I look at it on my desk and think of him. This is my favourite picture of Wilhelm Pfenning. Taken in our field by Laura Berman (Greenfuse Photography) it captures our memories of him perfectly. My father-in-law became much more to me. He was a warm hug when I needed comfort, he was a support for parenting our three rambunctious boys, and he was a mentor. My own father is an ocean away. Papa considered it his duty to fill in for the missing affection and care that my father would have given. He was more than up to the task. Our boys are smart, energetic and often come up with creative ways to test our parenting skills. Papa was always ready to step in and remind them in no uncertain terms where the line was. He loved each one of his grandchildren and wanted only the best for them. I know he was proud of the accomplishments they were already achieving. Papa was the voice of wisdom in many decisions. When we were faced with difficulties in dealing with a situation, Papa offered his advice thoughtfully and honestly. He always took the high road and told us time and again to not work with anyone who forced us to compromise our values to get the deal. His voice will continue to guide us even though he is not here in body. In sifting through the memories and recalling daily words of wisdom, the defining ideas gradually took shape. 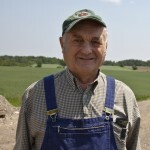 The recipient of this award will be a person working on the Pfenning farm who demonstrates a commitment to high moral standards and a strong work ethic. They will be a leader whose vision motivates people around them and whose ego doesn’t rule their actions. They will take pride and joy in a job well done. Finally the recipient will be a person whose life philosophy forms the foundation of their decisions in their everyday life. The nominations for the first recipient were challenging to choose from. Our teams are all dedicated and hardworking: smiling, laughing and even singing at the end of a long day. The inaugural winner (drumroll please) is a woman whose smile can light a room even after working in sweltering heat for hours. Rupinder Dhesi is the leader of our largest team. She is a leader both on the farm and in her community. Her van is the bus that brings many of her team to work each day. Rupi has an incredible ability to be friends with her team and be a coach; she listens to what they have to say. When there are tensions in her team, she handles them with grace and respect for each person. Her calm, quiet competence comes from a strength of character and integrity that is evident in everything she does. Truly, without her leadership, managing the growth of the farm in the last few years would not have been possible. A fantastic recipient of this wonderful award. Wow, you must have lost Wilhelm right around when we met. The Eulogy was tear-inducing. Most people are either in therapy trying to get over their parent issues or should be but are still too messed up to realize it. Sounds like everyone could have used a Wilhelm. That said, I can’t say I’m shocked. You guys have a abundance of nice and solid going on over there and character doesn’t grow on treas. Based on the bunch of people we’ve worked with over there, I don’t envy the challenge you’ll have figuring who who doesn’t get that award each year :). Congrats to Dhesi and congrats on the new tradition. Seems like the kind of thing Wilhelm might have done. Congratulation Ruby. An emotional read.